Provide comfort for the family of Darrell Dye with a meaningful gesture of sympathy. 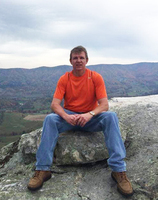 Mr. Darrell Repass Dye, age 47, of Honaker, Virginia, passed away Saturday (April 13, 2019) in Bristol, Tennessee. Born February 18, 1972 in Richlands, Virginia, he was a son of Gaynell Hubbard Dye of Honaker and the late James Repass Dye. A lifelong resident of the area, he was a 1990 graduate of Honaker High School. He went on to further his education by attending Southwest Virginia Community College, earning his Bachelor’s Degree in Finance from Radford University, and his MBA from King College. He was currently employed as First Vice-President of Enterprise Risk Management Office at New Peoples Bank. He was one of the founding members of Grace Fellowship Church of God, where he was part of the Worship Team, taught Bible studies, served on the church council and was a leader within the Youth Program. Having a passion for instilling good values in the youth of the area, he assisted in coaching several community sports programs. He enjoyed fishing, hunting, golfing, skiing, but most of all spending time with his family. In addition to his father, he was preceded in death by his paternal grandparents, Walker and Sillar Dye and maternal grandparents, Eddie and Viola Hubbard. In addition to his mother, survivors include one son, Bryce Dye of the home; three siblings, James Michael Dye and wife, Julia of Abingdon, Patricia Salyers and husband, Tracy of Roanoke, and Carter Dye of Honaker; niece and nephew, Brandon Salyers and wife, Brittany Salyers and Missy Cauley; great-nieces, Ashley Lee, and Kaitlin Cauley; special great-nephew, Colton “Little Man” Salyers; several aunts, uncles, cousins, in addition to his church family and work family, and a host of friends also survive. Funeral services will be conducted at 11:00 AM Wednesday in the Honaker Funeral Home Chapel, Honaker, Virginia with Revs. Yul Miller, Tim Dye, and Mike Dye officiating. Interment will follow in Greenhills Memory Gardens at Claypool Hill, Virginia. Pallbearers will be Tracy Salyers, Scott Miller, Vince Miller, Vince Sizemore, Brian Whited, Benny Chafin, Jim Richardson, Daniel Overstreet, Evan Harmon, and Brandon Salyers. Honorary pallbearers will be cousins, Dwight Jackson, Stan Bostic, Johnny Burton, Tyler Hale, Ethan Farmer, Hunter Eaton, Dakota Hall, Connor Wallace, Josh Eaton, David “Peanut” Eaton, and Hunter Short. Cousins will serve as flower girls. In lieu of flowers, memorial contributions may be made to the Bryce Dye College Fund at New Peoples Bank. The family will receive friends at the Honaker Funeral Home after 5:00 PM Tuesday, where a Celebration of Life Service will be conducted at 7:00 PM. To send flowers in memory of Darrell Repass Dye, please visit our Heartfelt Sympathies Store. Becky Griffith sent flowers to the family of Darrell Repass Dye. We are so sorry to hear of Darrell passing away. Condolence & prayers to all the family & friends. I worked with Darrell at the bank years ago. He was so proud of his son and was quite a devoted father. I'm shaken that this could happen so soon, but if anyone deserved a heavenly reward, it's Darrell. Prayers and positive energy for his family, co-workers, and loved ones at this time. You have gained your heavenly wings way to soon. Rest in peace Darrell. My heartfelt condolences to your loving family and friends. Your smile, kindness and knowledge will truly be missed by everyone.